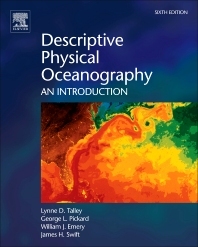 Descriptive Physical Oceanography, Sixth Edition, provides an introduction to the field with an emphasis on large-scale oceanography based mainly on observations. Topics covered include the physical properties of seawater, heat and salt budgets, instrumentation, data analysis methods, introductory dynamics, oceanography and climate variability of each of the oceans and of the global ocean, and brief introductions to the physical setting, waves, and coastal oceanography. This updated version contains ocean basin descriptions, including ocean climate variability, emphasizing dynamical context; new chapters on global ocean circulation and introductory ocean dynamics; and a new companion website containing PowerPoint figures, lecture and study guides, and practical exercises for analyzing a global ocean data set using Java OceanAtlas. This text is ideal for undergraduates and graduate students in marine sciences and oceanography. Advanced undergraduates and graduate students in the marine sciences and oceanography. Lynne Talley is a Professor of Oceanography at Scripps Institution of Oceanography (SIO), University of California San Diego. Lynne is a seagoing oceanographer with research interests in the water mass distributions and circulation of the world ocean. She is a graduate of Oberlin College (B.A. in physics) and the Woods Hole Oceanographic Institution/Massachusetts Institute of Technology Joint Program (Ph.D. in physical oceanography). She has been an editor of the Journal of Physical Oceanography and has served on the Intergovernmental Panel on Climate Change (AR4 and AR5), many committees of the National Academy of Sciences, and planning and steering committees for major field programs, including the World Ocean Circulation Experiment (WOCE) of the 1990s and the U.S. Global Ocean Carbon and Repeat Hydrography Program. She is a Fellow of the American Academy of Arts and Sciences, the American Geophysical Union, the Oceanography Society, and the American Meteorological Society.